An Uplifting Oil that Keeps Negativity Far Away! Three Wise Men Essential Oil is a very spiritual oil that contains sandalwood, frankincense, spruce and myrrh. All of these oils have been used for thousands of years to open and enhance spiritual communication with the creator. The blend opens the crown chakra and protects from negative energies and bombardment as well. So, 3 Wise Men essential oil is a great blend for massage therapists, Reiki and Raindrop practitioners. Three Wise Men Essential Oil also assists in releasing emotional and spiritual blocks and negative memories. When we are able to do this, we are able to move forward easier on our spiritual path and open up to new opportunities. This is an easy reference guide for Three Wise Men Oil Blend. It will tell you how to use your oil blend and what to use it for. It will also provide you with some fun tips and testimonials! Want to Purchase Therapeutic Three Wise Men Essential Oil? Go to the Oil Shop! Buy Three Wise Men Oil Here! What is in Three Wise Men Essential Oil? There are five therapeutic grade essential oils in Three Wise Men! They are listed below along with a brief description of each oil. Myrrh Essential Oil (Commiphora myrrha) is a very powerful antioxidant. Supportive to healthy skin. Juniper Essential Oil (Juniperus osteosperma) It may work as a detoxifier and cleanser, is beneficial to the skin, and supportive to the urinary system. What are the Documented Uses for Three Wise Men Essential Oil? Apathy, balance, blocks, cleansing, concentration (poor), day dreaming, defeated, unlock negative memory, forgive and forget, frustration, grief and sorrow, personal change, protection from negative emotions and memory, positive feelings, sadness, spiritual awareness and protection, stress, visualization of goals,void and emotional clearing. What is the Aromatic Affect on the Mind? This spicy, incense-like aroma is grounding yet uplifting. What is the Spiritual Influence? 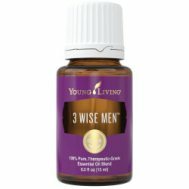 Three Wise Men essential oil releases negative emotions of fear, exhaustion, and frustration. It will help you open to joy, excitement and personal change. When we can unlock emotional blocks, it is so much easier to move forward on our spiritual path. This oil is used frequently in energy work not only because it facilitates emotional clearing but also because it protects the wearer from negative energies and emotions of those around us. This is important when doing intuitive work; if we are picking up other energies then we are not transforming others or ourselves. So it is important to stay centered and protected. Can this oil be used for Animals? Yes. It will help them release negative memories and emotions. What are the Safety Precautions? Possible skin sensitivity. Dilution not required; suitable for all but the most sensitive skin. Generally safe for children over 2 years of age. Apply in a clockwise motion to the crown of the head as to produce energy of opening and releasing.